Samsung takes aim at enterprise with "Safe"
For a while, there were rumors swirling that Samsung could purchase RIM in an effort to leverage the BlackBerry technology in the enterprise market, but today at CES, Samsung explained a bit on why it never made that deal. 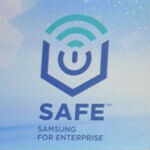 Samsung has announced Samsung for Enterprise, which has been branded with the name "Safe". Well before Samsung got to this part of its press conference today, Tim Baxter, president of Samsung Americas, said, "The Bring Your Own Device trend has come to a tipping point." This seemed to be a direct shot at BlackBerry, by saying that selling directly to enterprise is a dead trend, and that today, employees simply use the smartphone they already own for their business communication. During the actual announcement of Samsung Safe, this trend was referred to as the "consumerization of enterprise". Apparently, Samsung Safe will be a framework to offer corporate e-mail, calendar, and contacts, on-device encryption of data, virtual private networks, and mobile device management. The announcement ended Samsung's CES press conference, and we expect to learn more about Safe over the next few days. This is just a rebranding of the original "Samsung Approved for Enterprise (SAFE)," which was launched October 2011, then reiterated at last year's CES.